For nearly five years, we've been changing the face of gaming through positive representation at gaming conventions online and in-person. To pay for those, we've been selling merchandise and collecting donations. We've long wanted to add plush versions of our adorable mascots to the arsenal of merchandise we sell, but until recently we didn't believe we could fund such an endeavor. That's where you come in! The more of these adorable, soft, plush mascots we fund through the Kickstarter, the more of a discount we'll get when getting them made, and the more extra stock we'll have to sell from our website. Your pledge not only helps us today, but it keeps helping us into the future as we continue to raise funds to expand the number of conventions we can take our events to. Along with the plush animals, we've also added in some add-ons - including an opportunity to get one of the exclusive Gen Con T-Shirts we only give to GMs and panelists, and tickets to online events run by some fantastic game designer and podcasters. AND, if you're going to be at U-Con in November, we're offering tickets to a 6-hour dungeon crawl and pizza party! We'll have the plush in your hands by October, which makes them perfect for Christmas presents and stocking stuffers (for rather large stockings). 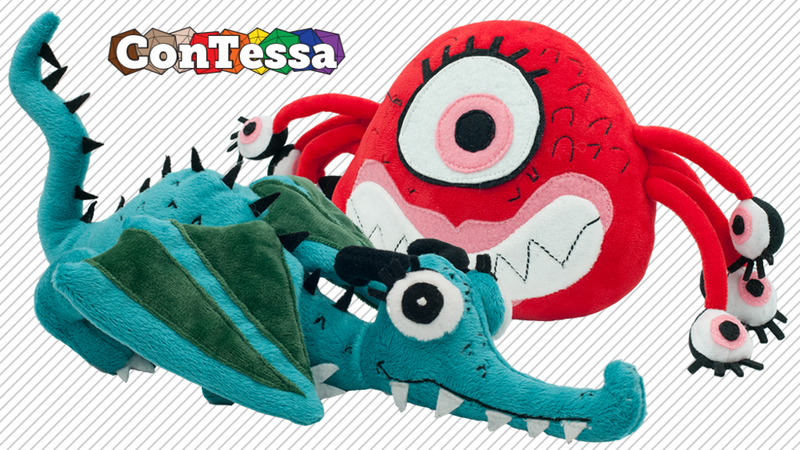 We're funding Tessa the Dragon first, with Bea the eye monster as our first stretch goal, and Mimi, our Mimic with the third. If we get all the way to a fourth, we'll break out our axe-wilding orc, Minerva! Stop by, check it out, and see you at the cons!